Heat oven to 450°F. Place pie crust in 91/2-inch deep-dish pie plate as directed on box for One-Crust Filled Pie. Bake 10 minutes or until golden. Cool. Reduce oven temperature to 375°F. In large bowl, beat eggs, whipping cream, salt and pepper with wire whisk until well blended. In medium bowl, toss ham and cheese with flour; sprinkle in bottom of crust. Pour egg mixture over top. Bake 45 to 50 minutes or until knife inserted in center comes out clean and edge of crust is golden brown. Let stand 10 minutes; cut into wedges. 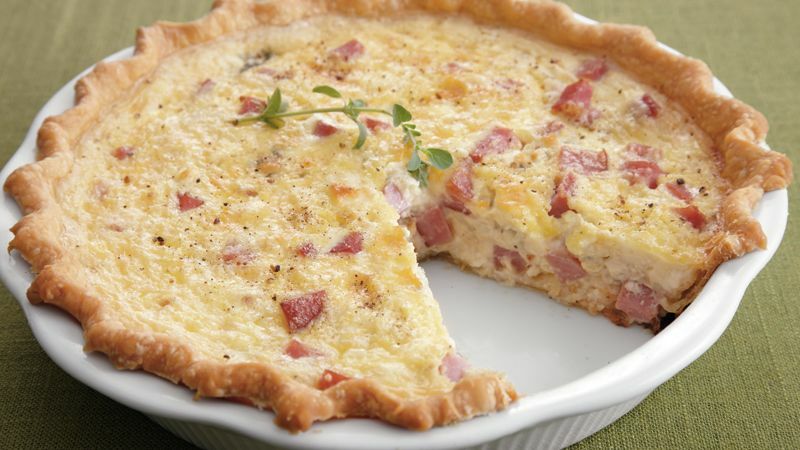 Ham and blue cheese flavor this traditional quiche. Substitute 1/2 cup crumbled bacon for the ham, if desired.